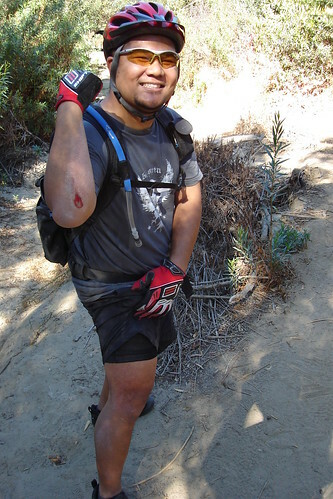 Yesterday morning I took out my buddy Mauro for his initiation to Mountain Biking at the Fullerton Loop. 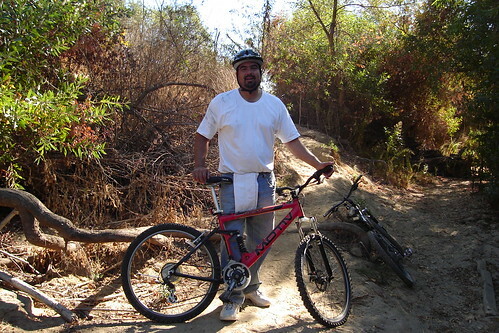 He did very well considering he hasn’t been on a bike in more than 10 years. Towards the end of the ride, there’s this sweet jump I decided to hit. I roll up to it with some good speed, hit the take off and then in mid air I saw a woman and her two big German Shepards right in front of me. I panicked because I was affraid I was going to hit them on my landing. I was so consumed that I forgot to look down towards my landing that was coming up fast.